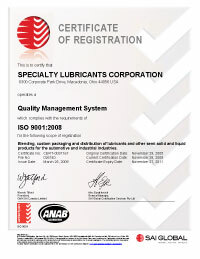 Since 2005, SLC CUSTOM PACKAGING’s parent company SPECIALTY LUBRICANTS CORP. has been independently audited and certified as meeting the full requirements of ISO 9001:2008. This registration indicates that we are in compliance with internationally accepted standards for quality. It assures that our products and services are developed, manufactured, and delivered using the latest in quality management processes. Our commitment to not only meet, but exceed these standards is evident in our procedures and policies. Continuous improvement is a never-ending effort involving everyone in the organization. We constantly strive to better serve our customers.